Russian President Dmitry Medvedev has delivered a keynote speech at the opening ceremony of the 41st session of the World Economic Forum in Davos, bringing together politicians and business leaders from all around the world. ­Before the Russian President started his speech, the assembly rose to honor the memory of the victims of the terrorist attack in Moscow with a minute of silence. The World Economic Forum's chairman, Klaus Schwab, noted that Dmitry Medvedev was successful as the leader of Russia. Under his guidance the country completed breakthroughs in innovation and successfully overcame the aftermath of the world financial crisis. He also noted a number of successes in Russia’s foreign policy and its relations with the US, in particular the signing of the so-called New START Treaty. When starting his speech, President Dmitry Medvedev said that the terrorist attack in Russia killed citizens of many countries and shocked society. He said he received letters of condolence from many leaders of other nations and that Russia was very grateful for that. 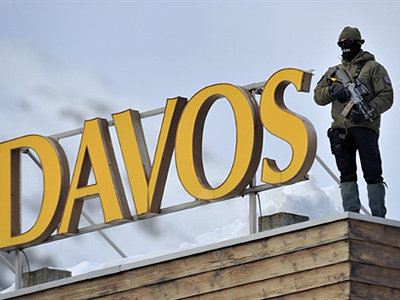 Medvedev said that the terrorists sought to bring Russia to its knees and take a defensive stance, and most importantly – that they sought to disrupt the Russian President’s visit to the Davos forum. The Russian President said that the terrorists miscalculated and pointed out that the mere fact that he was speaking was a sign of the terrorists’ failure. Dmitry Medvedev said that terrorism prevents people from making the world a better place. It also breaks the everyday course of life and forces leaders to make harsh decisions. A terrorist attack can occur any place now and globalization has made all nations interconnected, the Russian President said. This means that all people must join together to fight, if not the ideological basis of terrorism than at least its economic basis – poverty, unemployment, illiteracy and being without parents. The global economic crisis, that followed the euphoria of rapid economic development, sobered the world up. 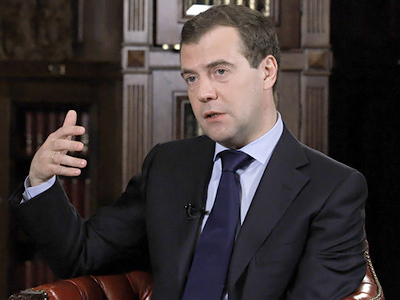 But it was not only the economy that made humanity learn lessons in recent years, Medvedev told the forum. Natural disasters and man-made catastrophes – such as the oil spill in the Gulf of Mexico, as well as the extreme heat in Russia last summer and the Icelandic volcano eruption that influenced huge regions and showed how fragile humans’ power on the planet is. Conclusions should be drawn from that and it is “dangerous to put that off”. The president stressed that it is necessary, finally, to come to a solution on climate issues. In addition, he recalled that Russia put forward an initiative for creating a global system of environmental monitoring and the prevention of emergency situations. Medvedev expressed hope that the idea would be supported by the international community. The Russian president has also touched upon the European security issue and said that such topics can be discussed at different forums and meetings, including the Davos forum. Moscow has long been pushing for signing a new treaty on the security of the continent and passed a draft to heads of the European states, as well as to international organizations. So far this initiative has not been met with much enthusiasm by Western partners. ­The Russian President also said that he wanted to tell the assembly a few words about Russia. Medvedev said that foreign nations are often criticizing Russia over certain drawbacks in its life, such as a lack of democracy, authoritarian tendencies and an imperfect court system. The Russian President called upon the international community to always remember the numerous challenges Russia is facing – such as terrorism, the poor state of the social sector and also the mistakes Russian authorities had made. At the same time, it is important to remember that Russia is developing. He said that Russia is fighting corruption and reforming its court system and these are all attempts to improve the investment climate in the country. “We are ready to listen to friendly advice, but no one should lecture us,” Dmitry Medvedev said. Moreover, he said that the attitude towards other nations is an indicator of the state of democracy, for it is not enough from a nation to be free itself – people must respect the freedom of others. At the same time, the Russian President noted that economic development is the basis of political reforms. A primitive, recourse-oriented economy cannot provide democracy in the political sphere and this makes modernization of primary importance, the Russian leader said. ­The president named 10 main directions for modernizing Russia’s economy, which will open new possibilities for business. The first is an unprecedented program for privatizing large state assets. “The list of strategic companies has been decreased five times,” he said. And in the next three years, shareholdings of leading companies in banking, infrastructure and energy sectors will also be privatized. Second, in the nearest future a special sovereign fund will be created which will share risks with foreign investors by making joint investments into modernization projects. Third, the next direction is the development of the financial sector in Russia. 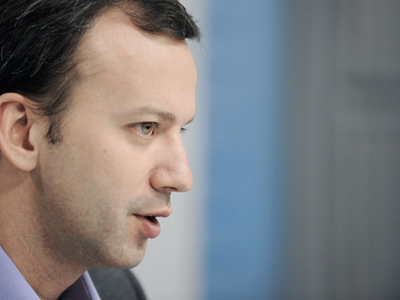 Medvedev noted that no additional taxes will be introduced. On the contrary, as of January 1 the country abolished the sales tax on operations with securities on condition of long-term investment. “We are not going to set limits on financial activity but, rather, broaden maximally the opportunities for financial institutions,” he said. Fourth is going to be the creation of new markets regulated by uniform rules. “Russia has long been ready to join the World Trade Organization,” the president observed, adding that he hopes that the process will finally be completed by the end of this year, “as it has been promised to me by all partners”. That will be followed by Russia’s joining the Organization for Economic Co-operation and Development. Fifth – the creation of new opportunities for business in the sector of innovations and venture investments. A program aimed at increasing energy efficiency has been named as the sixth direction for modernizing the Russian economy. “All new projects – whether they are private or state – will have to meet modern demands for efficient uses of energy,” Medvedev said. The seventh is the exchange of technologies between countries, including in the defense sector. In that respect, the president recalled a recently signed Russian-French treaty for building four Mistral-class amphibious assault ships. Then, there is a program on introducing broadband Internet connection throughout all of Russia. “We are ready to give unlimited opportunities for any legal business with its use,” Medvedev said. Education was named as the ninth direction. “We would like to make Russia attractive for the best world minds,” he said. The president noted that the migration rules for highly-qualified specialists have been eased. Infrastructure projects are ending the list. Medvedev observed that holding big international sports events in Russia would give the country a chance to renovate its infrastructure and make it more convenient for citizens and trade. ­In his opening speech, Dmitry Medvedev emphasized that Russia is against any attempts to limit freedom on the Internet, which has linked millions of people living in different part of the globe. That universal linkage “will become a powerful driver for economic development”. Any attempts to cut those connections, limit freedom on the World Wide Web or the spread of innovations “will lead the world to stagnation”. Russia will not support any initiatives that would challenge the web’s freedom, as long as that freedom is within the requirements of the law and morality, he said. Today politicians, international relations and principles of regulation are often lagging behind this progress. While some politicians keep living “by phantoms of the Cold war” and “primitive ambitions based on power”, almost one billion people are using social networks. No national government can pretend to have full control over such communities, “which is perhaps for the best”. However, the dark side of such global linking is that they can be used by extremists and terrorists to influence people’s minds, he added. ­The Russian president believes that the international community should use all possible opportunities to build a new, fair world where billions of people would be able to communicate, have no fear of authorities, and where international relations would be free from double standards and hypocrisy. “That should be the world where it would be easier, better, and more efficient to work together,” Medvedev said. Since new politicians, who were raised in the post-Cold War period came to power, that task is realistic. He named four principles that should be observed in order to achieve that. First, it is a strategic and long-term approach to solving problems. Simple and “populist” decisions often appear to be wrong or even “the worst of all possible choices.” Medvedev said that in times of crisis many countries tried to solve all economic problems by nationalization, “including the nationalization of financial institutions”. Russia abstained from using this approach “and I believe it was absolutely correct,” Medvedev said. The second principle is to be realistic and live within one’s means. According to Medvedev, ordinary people, businessmen and scientists do have their right for “excessive” risk – within reasonable limits. On the contrary, states and the world on the whole cannot afford this risk. He said that many developed countries today experience a “crisis of sovereign debt”, budget deficits and, at the same time, are not ready to cut their spending. “This situation can lead to new world economic and political crisis,” he warned. The third principle is a global partnership and efficient organization. Medvedev noted that the creation of the G20 was a huge step forward. He admitted that while many countries are holding talks at one table, making decisions is a lot more difficult. At the same time, those decisions are of a higher quality. “I hope that the G20 has proven that,” he added. However, he said that the work of the group should become more efficient. The fourth and final principle for the creation of a new world are different models of market economies and national models of democracy. “The world based on a single format…is full of risks. A multi-format world compensates such risks and gives a chance to adapt to new risks,” he said. ­After the Russian President delivered his speech he faced a number of questions from the forum chairman and the audience. ­The first question was about the attitude regarding the latest events in Tunisia, where a people’s uprising toppled the president and his administration. Dmitry Medvedev said the events in Tunisia were an example of what could happen when a country’s authorities are lagging behind the development of society. Everyone must remember that the elections can bring to power those forces that are not welcomed by the international community. This is a challenge to the Tunisian people, the Russian President said, and added that he personally hoped that they would overcome the crisis. ­Answering a question about corruption in Russia, Dmitry Medvedev said his country was not the only nation in the world where corruption existed. He said that only a methodical fight against corruption and a real investigation of crimes can overcome this vice. The civil servants must understand that they will inevitably face a civilized form of reporting and registering all their income. Another important step to overcoming corruption is the improvement in the court system. Russia has already adopted anti-corruption laws, but now we must learn to use them, the Russian President said, adding that this was his own objective as a manager. 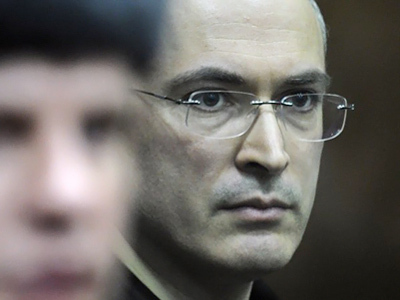 He also said that the monitoring of the court system must be improved, which Russia is already doing. ­The Russian leader said he was especially glad that the signing and ratification of the New START treaty ended in success. It has been almost brought to a logical end, Dmitry Medvedev said. At the same time, he noted that the parties must not stop and the continuation of cooperation must be, among other directions, in the sphere of missile defense. Medvedev stressed that Russia is a part of Europe and also wants to feel safe and thus sent its proposals on building a common defense system. ­Speaking on the problems and fears connected with the Iranian nuclear program, the Russian President said that Russia and Iran remain neighbors and partners. The international community has questions for Iran regarding its nuclear program and the Iranian authorities must answer these questions. So far, there is no information that Iran actually possesses nuclear weapons, but they are also not a member of the non-proliferation agreement and thus they must prove their peaceful intentions, Dmitry Medvedev said. The Russian leader added that he had discussed the issue with the President of Iran and he said that he fully agreed with this. ­When asked what he thought would appear on WikiLeaks if the notorious web-site starts publishing materials on Russia, Dmitry Medvedev said that he thought the whole WikiLeaks story could actually make international relations healthier, despite the fact that the actions of internet activists could be actually illegal. He also said that the materials that WikiLeaks have so far disclosed were not a secret. “Of what I read in WikiLeaks about Russia, I learned nothing new and occasionally I had a feeling that most assessments that got onto WikiLeaks were copied from popular political websites on the Internet,” the Russian President said. “If someone got hurt, it was not us. We are strong guys,” Medvedev added. He also said that today, when billions of people are connected through Internet networks, no secret can be safe from disclosure. 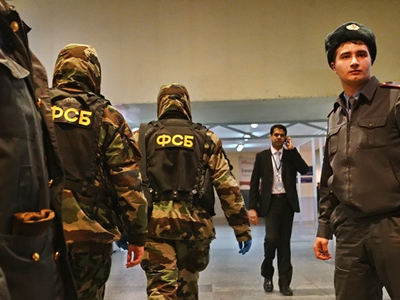 The President’s program at the biggest economic forum has been reduced significantly due to the deadly blast at Domodedovo Airport on Monday. Medvedev arrived in the Swiss ski-resort on Wednesday afternoon and will most likely wrap up his visit as soon late in the evening the same day. For different reasons, neither President Boris Yeltsin, nor President Vladimir Putin attended the forum during their presidencies. “We need to fill this gap,” he said.It is not Medvedev’s first appearance at the forum though, as back in 2007 – when he was the First Deputy Prime Minister – he traveled to Davos with the Russian delegation. Before the opening ceremony, Medvedev met the International Business Council of the CEOs of the world’s top 100 companies. Earlier on Wednesday, the president’s press secretary Natalya Timakova said that no bilateral talks were planned on the sidelines of the gathering. After the president returns to Moscow, all the events that the Russian leader was to take part in would be chaired by the First Deputy Prime Minister Igor Shuvalov. Watch Dmitry Medvedev's speech at the World Economic Forum in Davos. Part 1. 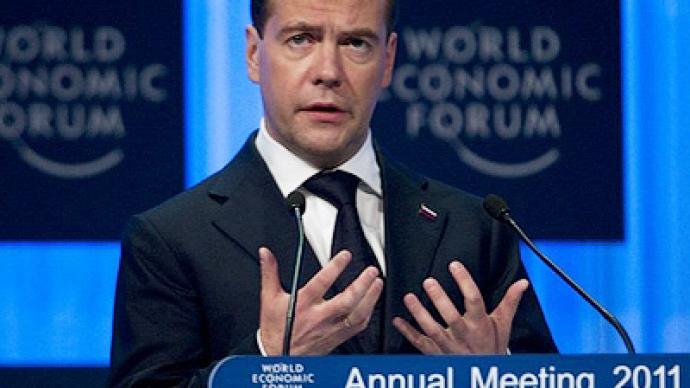 Watch Dmitry Medvedev's speech at the World Economic Forum in Davos. Part 2.